There is a lot you can say about Weston Peick. The guy is built like a brick house. He is one of the most underrated riders on the circuit. He has been overshadowed by flashy past and current teammates Justin Barcia and Justin Bogle. Although Weston might not be the standout guy, you can always count on him to be there. That tells you a lot about someone. Out of the current crop of factory riders, Weston had it the hardest. Weston was a full privateer rider who paid his way to the races for years. IT WAS THE JGR TEAM THAT TOOK A CHANCE ON WESTON. ALTHOUGH IT MAY HAVE SEEMED LIKE A GAMBLE, TO JGR TEAM MANAGER JEREMY ALBRECHT, WESTON WAS A SURE BET FOR CONSISTENCY. It was the JGR team that took a chance on Weston. Although it may have seemed like a gamble, to JGR team manager Jeremy Albrecht, Weston was a sure bet for consistency. And, in this day and age, consistency is hard to find. Don’t believe us? Fourteen of the top 20 riders in the 2018 Supercross season missed one or more races. Weston was one of only six riders (Jason Anderson, Justin Brayton, Blake Baggett, Vince Friese and Chad Reed) to race all 17 rounds. How were we lucky enough to ride Weston’s AMA 450 National bike you ask? We know the right people. Past MXA Managing Editor John Basher is now the Communications Manager at JGRMX. And, since MXA tests in the Carolinas virtually every spring, we were heading east anyway. So, John pulled a few strings for us with Joe Gibbs Racing. We were very interested in riding a factory 2018 Suzuki RM-Z450. We haven’t had the best of luck with them in stock trim, so we were hoping we could learn a thing or two. The JGRMX team of Rene Zapata (Weston’s mechanic) and John Basher brought the bike down to ClubMX in South Carolina for us to shake down. 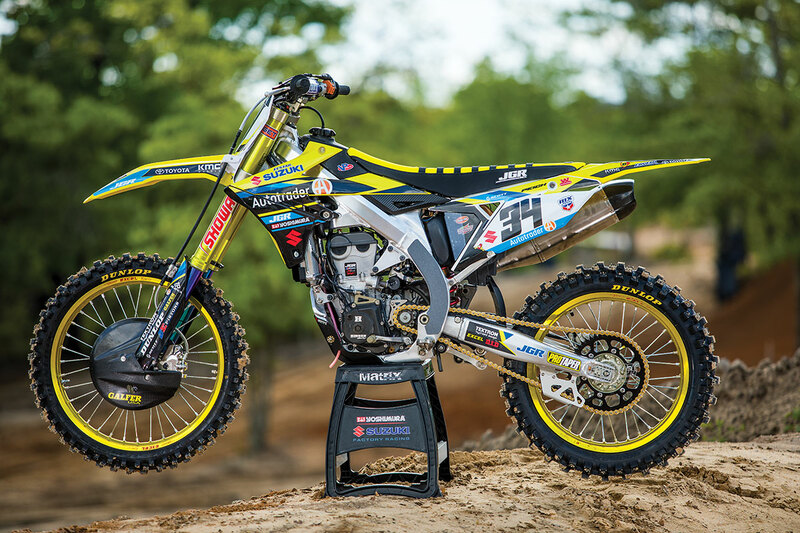 Here is what we learned about Weston’s Autotrader/JGRMX Factory Suzuki RM-Z450. Weston is a bulldog on the bike. There is no finesse in his riding style. And that’s okay. It is his way of getting the job done. He has the strength and genetics to go through things rather than around them. These hard impacts combined with his 200 pounds of solid muscle make Weston’s suspension setup different from that of many of the lighter riders. The initial travel of Weston’s Showa Spring air-assist forks is super rigid and stiff. 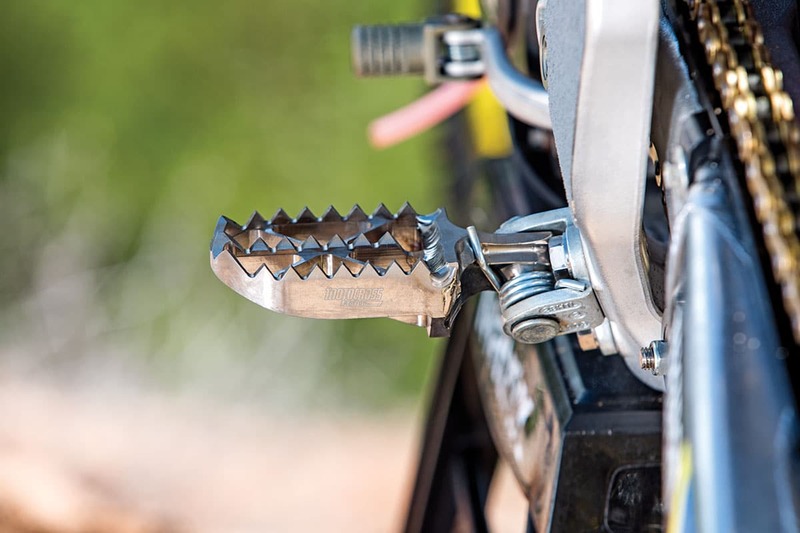 If you are a Vet or lower-level rider, hitting bumps on it would be like riding a wheelbarrow down a rough mountain trail; however, if you are fast enough and brave enough to break through the fork’s crust, there is plushness to be found. It took a while for our test riders (who were both former AMA National riders) to break through the Showa’s initial harshness. It felt like a jackhammer at slow speeds, but the faster they went and the more they smashed into stuff, the smoother the forks got. Did we mention that the air assist forks had no air in them. Weston likes the feel of the coil springs without adding the buffer of air. Could we bottom Weston’s forks? We felt like we might have been able to once we got the forks in the plushest part of the travel, but the stiffness ramped up quickly in the last few inches. 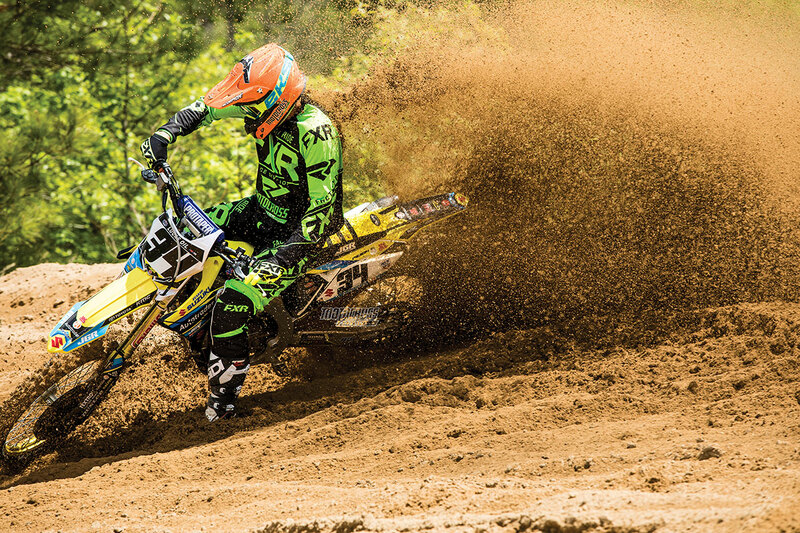 Overall, the MXA wrecking crew felt like they could fly on Weston’s RM-Z450. They could over-jump, smash, hit and pound into anything they wanted without any repercussions. The downside? You have to be in exceptional shape to hang on. 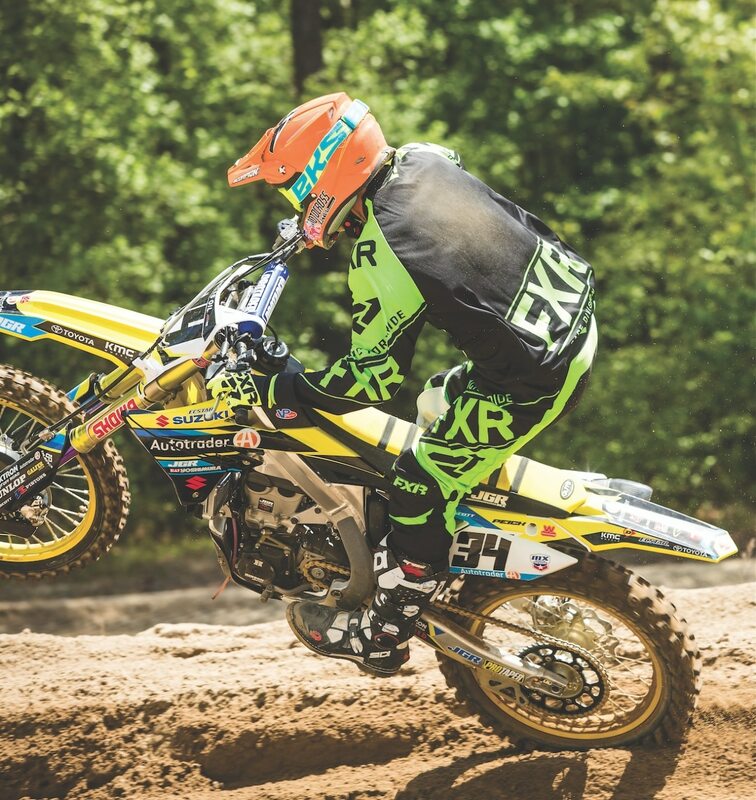 It is no secret that th MXA test riders had major handling issues with the 2018 Suzuki RM-Z450, especially the BFRC shock’s tendency to follow its own path in the rough. After riding Weston’s bike, we now know that our assessment of the stock BFRC shock was spot-on. 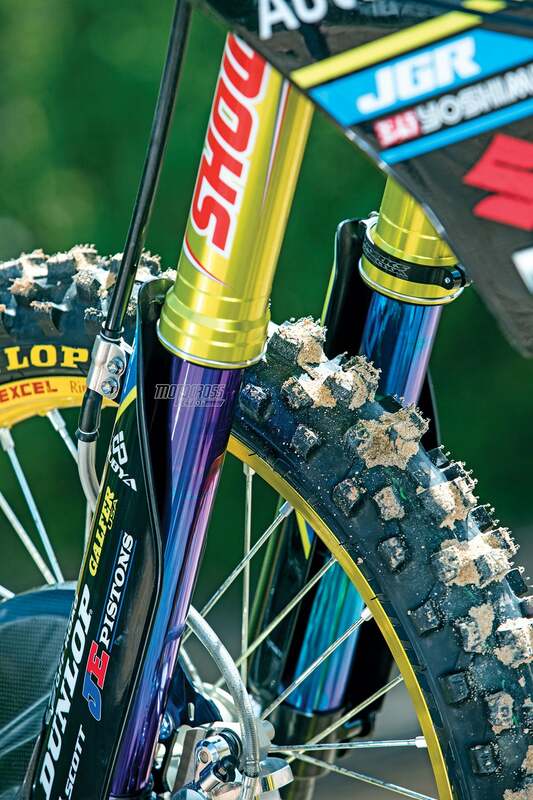 As we rode Weston’s RM-Z450, it had the old-style Factory Showa shock instead of the new BFRC shock. We don’t want to throw the BFRC’s technology under the bus, because it just needs more development time. TALKING WITH WESTON’S WRENCH, RENE ZAPATA, WE FOUND OUT THAT WESTON IS CURRENTLY TESTING UPDATED SETTINGS ON A FACTORY VERSION OF THE BFRC SHOCK. Talking with Weston’s wrench, Rene Zapata, we found out that Weston has been testing updated settings on a factory version of the BFRC shock with Weston may run this year. Rene says so far Weston prefers the modified BFRC shock. Only time will tell. If you are thinking about running the stock Showa shock from the 2017 model, forget about it. It doesn’t fit in the new frame. Suzuki has heard the complaints loud and clear, and we are hoping the issue will be resolved come 2019. As much as people think that MXA hates Suzukis, we actually have loved their handling for decades. And, since we have tested more factory Suzukis than almost anybody in the world, including the bikes of Sebastien Tortelli, Jeremy McGrath, Ricky Carmichael, Travis Pastrana, Greg Albertyn, Davi Millsaps and Ken Roczen, we actually know how good they can be. Weston’s triple-clamp offset was stock, although the factory SMC clamps were less rigid and had rubber-mounted bar mounts. Weston’s subframe was cut 5mm, and his sag was set between 106mm and 108mm. This flattened the seat and shifted the weight bias towards the rear, making for a more balanced feel. Although, there was one caveat—the bike had superb handling just as long as your body position was in the right spot. MXA’s test riders felt that they had to stretch out on the bike, both when sitting and standing. If they were too far forward, the front end wanted to tuck. If you watch Weston, he stays in one consistent position when riding. He doesn’t move around a lot like Jason Anderson. As far as the rest of the chassis setup, it was basically stock. Rene mentioned that the Supercross setup had many more changes to the chassis, but for the outdoors, the team riders liked the geometry, head tube stiffness and flex of the stock 2018 RM-Z450 chassis. Weston’s triple-clamp offset was stock, although the factory SMC clamps were less rigid and had rubber-mounted bar mounts. Weston’s trick $1000 titanium footpegs were lowered and brought back 5mm (which contributed to the long, flat feel). On a side note, Jimmy Decotis and Kyle Peters request that their pegs be 12mm taller due to their short stature. These pegs can be custom ordered through www.jgrmx.com, although you will have to throw down 10 Benjamins to fill the invoice. Weston’s control setup is fairly neutral. He runs Pro Taper Factory Suzuki bend Fuzion bars that are at the same angle as the clamps. He runs half-waffle grips with the waffle placed higher than normal. His levers are in a very neutral position. He does run an ARC clutch perch mated with a CR-style clutch lever. It is on the skinny side. His rear brake pedal is low for a Pro setup. It is below the height of the already lowered footpegs. 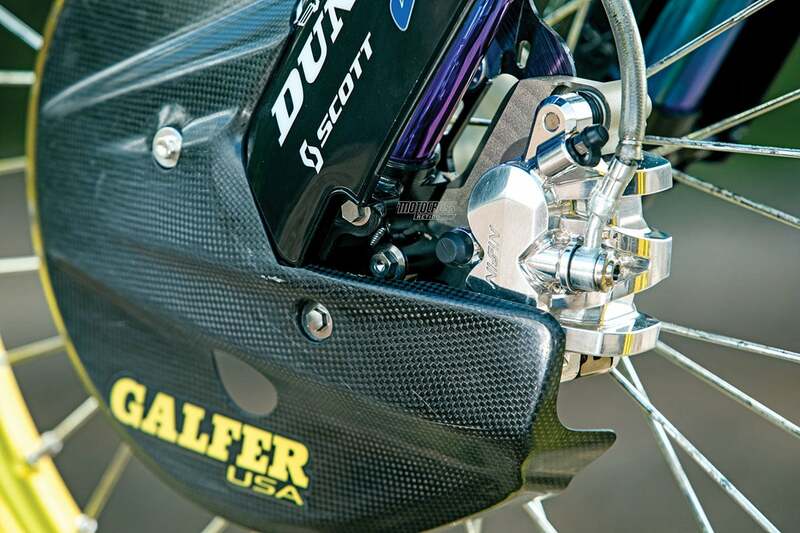 MXA’s Pro test riders come from the modern high-brake-pedal school and had trouble getting used to the low feel. Weston runs a stock shift lever with a 5mm SMC Factory extended tip. We liked the longer feel. The seat was the stock shape and height but with a Guts seat cover and ultra-light seat foam inside. 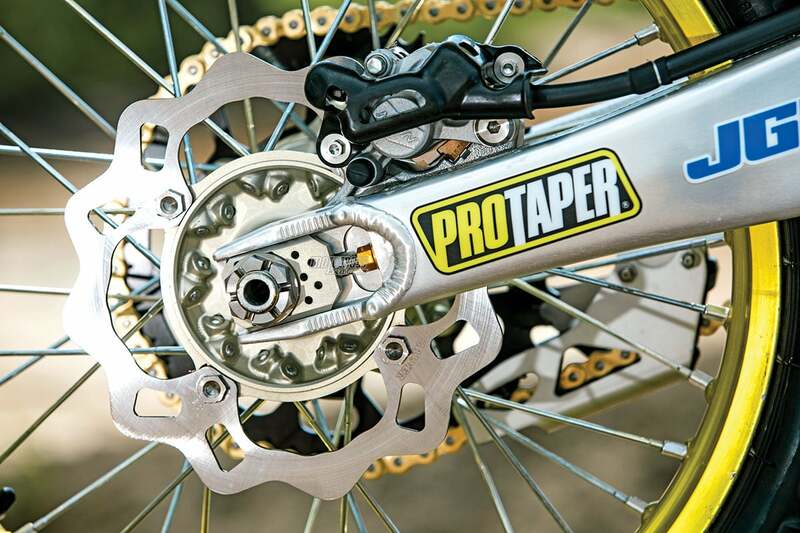 On the sides of Weston’s frame, he uses Safety-Walk grip tape to help him grip the bike with his inner legs. It is a soft-compound grip tape that isn’t as hard on boots or gear. THE GEAR; Jersey: FXR Clutch Retro, Pants: FXR Clutch Retro, Helmet: Scorpion VX-R70, Goggles: EKS Brand GOX Flatout, Boots: Sidi Crossfire 2 TA. Weston’s Factory Nissin front brake system is a work of art. The price tag is in the thousands of dollars. How do we know? Because we asked about getting a caliper and master cylinder setup for our bikes. Is it worth the money? Yes, but it’s not for sale. The front brake is powerful yet progressive. It is a front brake that you can operate with one finger without exerting your digit to stop on a dime. It offered smooth modulation and power that was effective. Why is there so much emphasis on the front brake? Weston doesn’t really care about the rear brake that much. There was nothing special about it. It is a stock caliper with SMC works brake pads. It doesn’t feel like it works any better than the stocker. According to Rene, Weston doesn’t seem to use the rear brake very often. Weston doesn’t really care about the rear brake that much. It is a stock caliper with SMC works brake pads. It doesn’t work any better than the stocker. 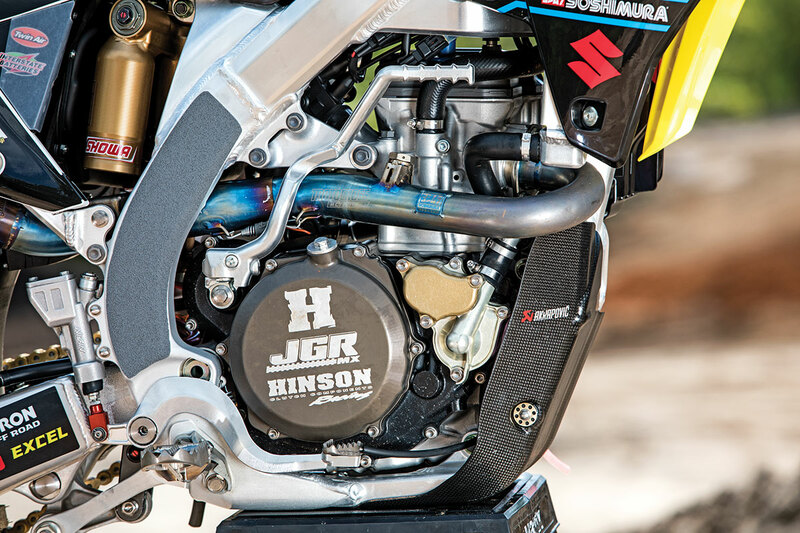 The engine is a collaboration between JGR’s in-house engine builder Dean Baker and the technicians at the Suzuki factory in Japan. We easily recognized the brands of the internal engine parts (JE piston, Carrillo rod, Xceldyne valves, Web Cam cams and Hinson clutch), but it is the customization of each part that makes the secret sauce. Instead of getting into the internals of the engine, which are largely unobtainium, let’s talk about how it ran. 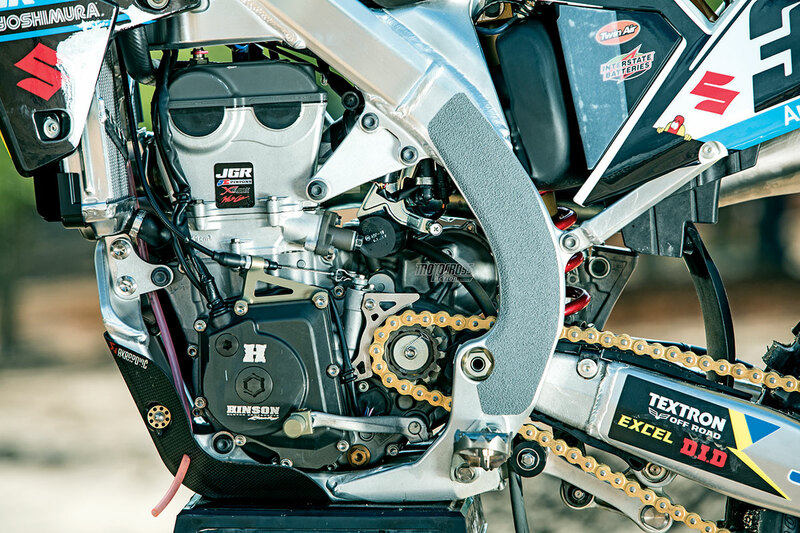 In a few simple words, Weston’s engine is smooth and powerful. The power was not overwhelming like that of some of the factory bikes we have ridden in the past. It was power that mere mortals could hang on to. When you needed more power, it was there at the twist of the throttle. The clutch didn’t need to be used in corners, as the big power would pull you through them. The bulk of the power was from bottom to mid, as Weston doesn’t like to rev out his engine (unlike Justin Barcia). Weston likes to keep the engine free feeling. He achieves that by shifting early. The Autotrader RM-Z450 didn’t lack top end or over-rev by any means, but you could feel that the sweet spot was focused in the meat of the rpm range. The ratios from gear to gear felt spot on. We were surprised to learn that JGR uses the standard gear ratios from first through fifth gear, but the gearbox was a special unit. We loved Weston’s engine. There were no hiccups, dips or dead spots. And although powerful, it was so easy to ride that we felt like we could hang onto it at our local racetrack during long motos‚ which isn’t always the case with powerful works bikes. The downfall of owning Weston’s race engine is that it needs internal maintenance at the two-hour mark. At the 120-minute mark, it comes apart, whether it needs it or not. His less exotic practice engines can go 15 hours before needing to be switched out. 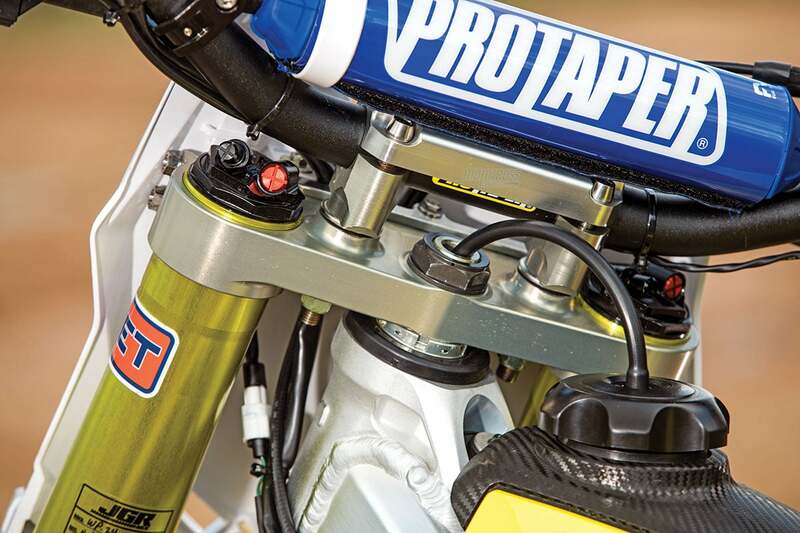 WESTON’S AIRBOX: HE BREAKS WHAT? Rene told us that Weston is hard on two things—clutches and airboxes. Rene changes out the fibers and metal plates after every moto, which is not unusual for a factory-level rider. We were curious about the airbox, though. Rene said both Weston and Malcolm Stewart tear them apart with their legs from gripping the bike so hard. This is something that we rarely hear. The solution? Suzuki Japan found a Teflon-based tape that is semi-transparent to put on the vulnerable parts of the airbox. Rene said that this tape is so strong that it would outlast the life of the motorcycle. Weston’s Factory Nissin front brake system is a work of art. There is a lot of carbon fiber, titanium and magnesium on Weston’s bike. It is used to lighten the 241-pound RM-Z450. You will be surprised to learn, as we were, that the addition of spring forks, a skid plate and a few other trick doodads made Weston’s factory RM-Z450 weigh about the same as the stocker, titanium or not. We will say that the rear end felt lighter than the stocker when lifting it off the stand; however, on the track it didn’t have a light feeling in the turns or bumps. JGR’s theory behind the madness is that a heavier bike is more stable than a light bike. True. But the same could be said about a rock. Weight may make a bike feel stable, but it also makes the supporting parts work harder while lessening nimbleness. 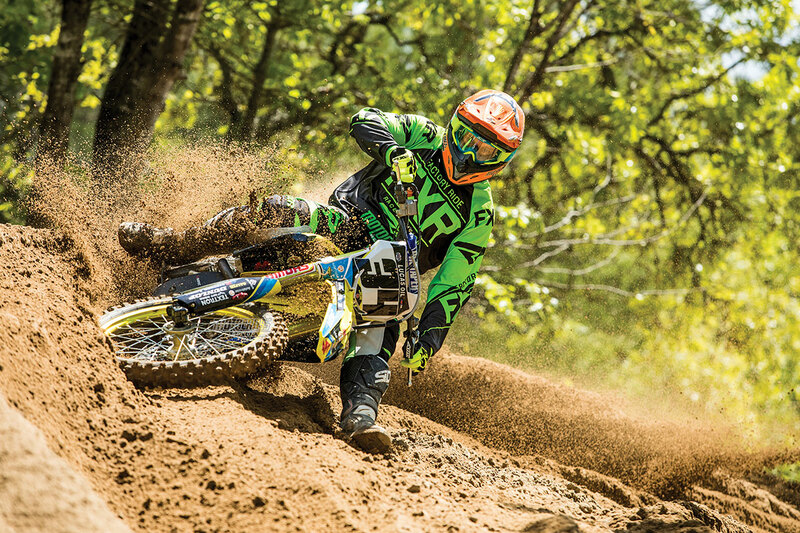 We are pretty sure that if Weston had a 220-pound RM-Z450, he wouldn’t bolt on 21 extra pounds to improve stability. But hey, these riders are super fast, and what they feel and what we feel might be totally different. There were some parts that weren’t ready when we showed up to test Weston’s bike. He will be running a larger-capacity, Italian-made, CRM carbon fiber tank. He’ll also run a rear mousse instead of an inner tube to ensure there won’t be any flat tires. Weston tested the all-new Dunlop MX33 tires during the Supercross season, and they were on the outdoor bike we tested as well. They are very aggressive and in dealerships now. Weston’s Autotrader/JGRMX Factory Suzuki RM-Z450 was almost everything we wished the 2018 RM-Z450 had been. It was easy for mere mortals to ride; well-suspended, especially in the shock department; and the chassis was much calmer than the production bike’s. It was fast but not scary fast. Hopefully, Weston will have luck with the BFRC shock so that what JGR learns can be transferred to the production bike. Why did we say “almost everything we wished?” Frankly, we expected a 230-pound JGR RM-Z450 (because there is no way that they would ever get to the AMA minimum weight of 220 pounds). We didn’t get that wish, but you gotta dance with who brung ya. Weston’s JGRMX Suzuki RM-Z450 is obviously a good dance partner.